What Type of Letter-Writer Are You? It doesn’t matter – your camper will love your letters! When it comes to letter writing, I try to mix it up – for example, this letter is quick and funny. 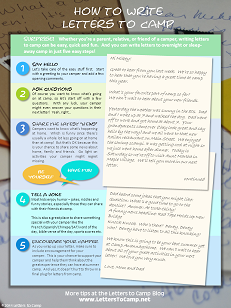 “So how exactly do I write letters to camp?” That’s one of the top questions we get here at the Letters to Camp Blog so we put together this handy reference guide. Click the image below to view in full size. 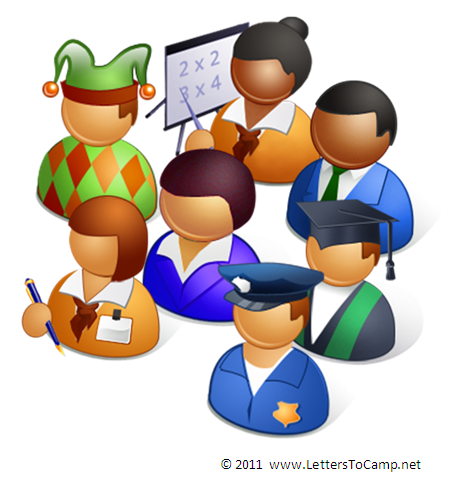 Read more in our blog post, How To Write Letters to Camp. Interested in learning more? Check out the Letters to Camp blog, which is loaded with ideas on how to write better, funnier letters. It’s Fido here. Mom took for a long walk in the morning and gave me breakfast. I waited in the crate for Dad to let me out. Dad actually took me for a five-minute run and at one point, I actually ran ahead of Dad – that was fun! Dad went out so I went back into my crate. When he got home, Dad let me out. At around 3, I barked at Dad. It’s like he just doesn’t get me – I was b-a-r-k-i-n-g. Obviously I wanted something. But what was it? Well, I just wanted a nice walk to survey my domain. Anywho, he figured maybe I needed to do my business, so he took me for a long-ish walk up and down the street. No business…. But it was great to get out for some fresh air. About an hour later, I barked again and jumped on Dad’s leg, so he gave me dinner. I love dinner! Hee hee hee… Dad thought that was enough for me – but he wr-ong! I sniffed something tasty in the dining room, so later on I secretly jumped on a dining room chair and grabbed Mom’s bread bag from the table, ripped the bag and had bread for dinner too! I just don’t know why Mom leaves bread on the dining room table. Later, Dad was sitting watching TV with me at his feet. I started to walk all over the family room and whine. No barking, just a whine and a whimper. Wow, he finally gets it! He thought maybe I had to do my business and that’s exactly what I did when he took me for another walk! That Dad – he’s the best even if I do have to bounce up and down and bark at him when I need stuff. Can’t wait to slobber on you 4 weeks from Thursday. Hope you’re having fun. Anyways, it’s been a busy day around here! This morning I went for a nice long walk. It was fun because I chased a few squirrels. I chased my tail too – but I could never catch it! I came home and had a great breakfast of yummy dog food… you would have loved it. Later on, the mailman came by to drop off a package. But I barked really loudly so he jumped and DROPPED the package (ah ha!). I thought it was funny but the package contained the crystal bowl that Mom had ordered and it broke and she was not so happy. I don’t know why, but I spent the rest of the day in my crate…. Well, I’ll bark at you soon! Hope you’re having fun.